ALT Annual Conference 2018 – Be a part of it! ALT’s annual conference for learning technologists is one of the largest of its kind. It brings together practitioners, researchers, managers and policy-makers from education and industry to explore, reflect, influence, learn and develop solutions. 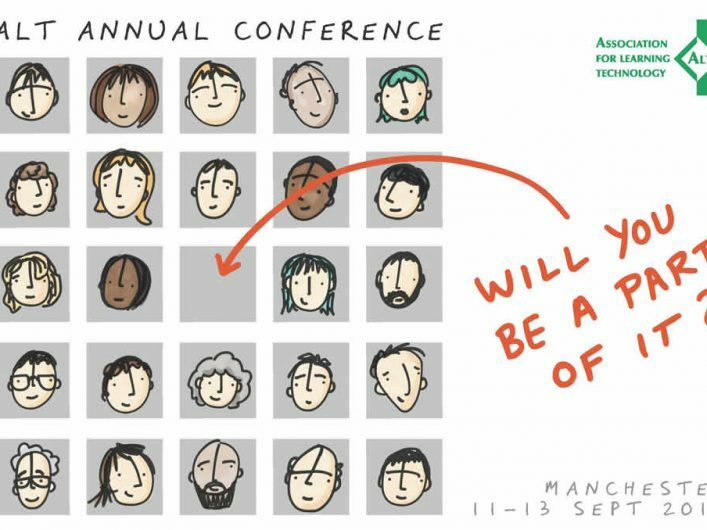 The next conference takes place in Manchester from 11 to 13 September 2018 and for ALT’s 25th Annual Conference we will bring together different critical perspectives in Learning Technology from across our community that will examine the challenges ahead and question the shape of things to come. This is your invitation to make your contribution to our 25th year as the UK’s leading professional body in Learning Technology. By joining the committee, you can help shape the conference. You will be able to review proposals, thus finding out about new ideas before they are presented at the conference. You will take part in promoting the Call for Proposals and the event itself. You will be invited to chair sessions at the conference, and you will be able to bring your fun ideas to shape the social programme of the conference. You will play a key role in this important event. Interested? More information about joining the committee.